Spoken by approximately 13 million people worldwide and recognized as one of the official languages of the European Union, Greek is a language worth learning, especially if you’re planning a vacation to the beautiful country of Greece. With a history spanning back 3,400 years, the Greek language is one full of complexities, nuances, and history. Not to mention, the cultural significance of the Greek language is enormous. Many root words stem from the Ancient Greek, especially in the fields of science and medicine. Therefore, not only is Greek a practical language to learn but also a helpful one if you are also interested in pursuing a career within the sciences. Even if you are only interested in learning Greek to make a trip to Greece easier and more meaningful, a single course is enough to get you speaking! Imagine ordering a gyro in Athens and being able to ask for it in Greek. Chances are that you will have so much fun learning a new language that you will be enticed to study a full Greek degree program or complete one of the many Greek language programs. No matter how much or how little Greek you pick up in the beginning, locals will surely appreciate the effort you are making to understand and make yourself understood. Whether you are studying Greek or another language, learning a new language can be one of the most rewarding experiences. Not only do you open your mind to a whole new way of thinking, you also train yourself to be more confident in creative as you get used to expressing yourself in the new language. It’s also a great way to connect with people from a different culture. Just imagine walking the streets of Athens and having the opportunity to chat with the locals about their favorite spots and recommendations. It can give you both insight into the best sights to see but also about how the Greeks go about living their daily lives! The choice to study Greek abroad, or any subject for that matter, can be both nerve-wracking and exciting. It’s difficult to imagine leaving friends and family behind, but at the same time, it’s also fun to think about all the exciting, new adventures you will experience. However, almost all students report that their study abroad experience was well-worth their time! When you study abroad, you open yourself up to a whole new lifestyle, group of friends, and culture. In effect, you become a more well-rounded individual who can communicate effectively cross-culturally and adapt to change. One thing is certain, you will love Greece and its culture. Steeped in rich mythology and history, the Greek isles are a place of exotic wonder and adventure! To start, visit the Parthenon and the Acropolis to get a glimpse back into Ancient Greece. 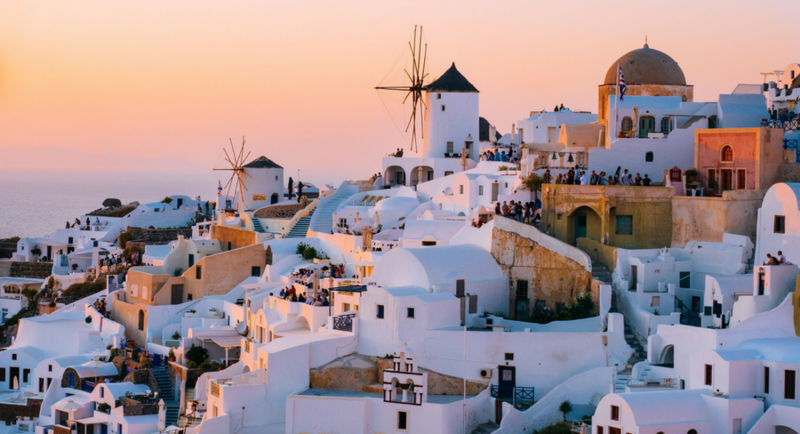 After, experience what modern Greece has to offer and explore the streets and markets of Athens while tasting some of the best dishes of Mediterranean cuisine. Once you are stuffed on gyro, you will be happy to have made the choice to study a Greek language program. No doubt about it!